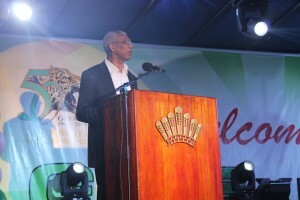 President David Granger, today, said that he has requested of Opposition Leader, Mr. Bharrat Jagdeo, that the curricula vitae for the six persons he has nominated to fill the post of Chairman of the Guyana Elections Commission (GECOM) be provided to him so that he can determine their suitability for the post according to the requirements outlined in the Constitution of Guyana. In an invited comment Thursday afternoon at the Ministry of the Presidency, the Head of State said that he received the list of nominations from the Opposition leader on Wednesday and has responded to that request. “I replied to him right away because although those six names might be known to the public, I could not be sure that their nominations were in accordance with the Constitution. I have asked him to let me have copies of the Curriculum Vitae of each one so that it can guide me in making my decision. So that is where we are now and I would say that the ball is in his court. I would say let me have the resume for the persons so we can go ahead with this process. It is very important that we have a Chairman as early as possible,” the President said. 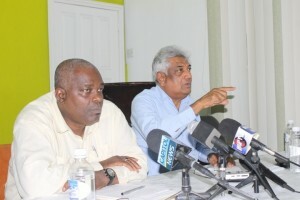 The Opposition Leader’s nominees are Governance and Conflict Resolution expert, Lawrence Lachmansingh; Attorney-at-Law and Chartered Accountant, Christopher Ram; former Chief Executive Officer of the now defunct Guyana Television Broadcasting Company (GTV), Rhyaan Shah; former Chief-of-Staff of the Guyana Defence Force Retired Major General, Norman Mc Lean; private sector executive Ramesh Dookhoo and History Professor, James Rose. The former Chairman of GECOM, Dr. Steve Surujbally’s resignation became effective as of November 30 after 15 years of holding the post.